Is Lobster the food of Romantics on Valentine’s Day? 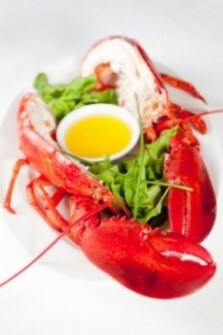 More than 42 percent of adults responded that they consider Valentines Day lobster the most romantic of all meals. Oysters are delicacies that are also traditionally served as part of a romantic Valentine’s Day meal. Oysters are thought to be aphrodisiacs in many cultures. Perhaps that is why these delicate shellfish are the perfect choice for Valentines Day dinners. Raw oysters on the half shell with ice cold champagne makes the perfect appetizer. Tradition holds that on this most amorous of holidays, lovers often enjoy two or three freshly prepared live lobster or a jumbo — four pounds or larger lobster — can be shared. Also popular as a main dish is split, grilled lobster tails. So while everyone else is fighting for reservations, trying to park, waiting for their table and getting rushed by the waiter, just say “No.” Instead, enjoy a Valentine dinner at home with a love fest of the best lobster and oysters in the world: the Maine Lobster and New England Oysters. Today live lobster can be shipped overnight right from Maine to anywhere in the United States. So take advantage and Cupid will be proud. Author WaynePosted on February 9, 2011 March 1, 2019 Categories Boston and Cape Cod, Holidays, LobsterTags buy lobster, lobster industry, valentine's dayLeave a comment on Is Lobster the food of Romantics on Valentine’s Day?